Oren's Money Saver: Free Money from Staples - Oren Strikes Again! I love it when Staples coupons come in the mail. Their online coupons almost always work on Visa gift cards. A Staples online coupon means that I can buy money at less than cost. That is never a bad price. The coupon I got was for $25 off a $75 purchase. 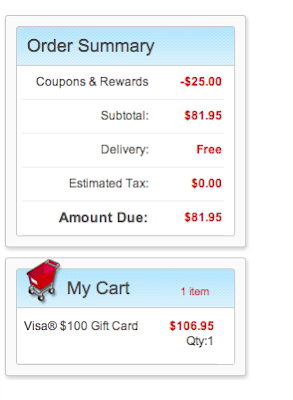 Staples sells Visa gift cards in $50 and $100 denominations so I picked up a $100 gift card. The normal fee is $106.95. After a $25 code, the final price came to $81.95 or 18.05% off! Not too shabby, but it doesn't end there. Now, that I know I'm going to buy the card, I need to figure the best way to buy it in order to get extra points/money. will get 5% extra for a total of 6% off the price. 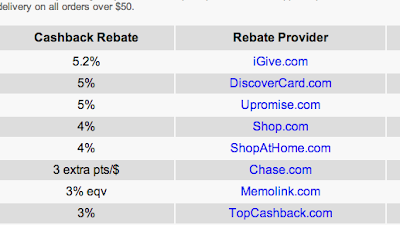 If I use the Chase Ultimate Rewards portal I will get 3 Ultimate Rewards points per dollar spent. However, I have a Chase Ink Bold card (there is an annual fee after the first year) which gives 5 UR points per dollar spent at office supply stores like Staples. Therefore, if I start shopping through ultimaterewards.com and use my Ink Bold, I will get an 8 UR points per dollar spent (655 points). 1 UR point is worth at least one cent because it can be redeemed for a penny so this is the equivalent of another 6.55% (8 points off the final price, not the value of the gift card) off the price for a total discount of 24.6%! Far less shabby!